Nearly 100 records owned by Joey Ramone are going up for auction online, along with some of his clothes, his passport, handwritten lyrics and his Rolodex, Billboard reports. Starting February 14th, the estate of the Ramones singer will auction off a 97-title vinyl collection including albums by Cream, Bob Dylan, Jimi Hendrix, Led Zeppelin, Iggy Pop, Lou Reed, T. Rex, the Kinks, the Human League, Toots and the Maytals and Yes. There's a minimum bid of $500, and the auction continues through February 21st. There are separate auction items for Ramone's passport, handwritten lyrics, two guitars he owned, a Rolodex containing music-business contacts and items of clothing, including a leather jacket, sunglasses and a lot of 140 of his t-shirts from bands including Nirvana and Motorhead, radio stations and locations. The auction runs through February 21st. All items include a letter of authenticity from the Joey Ramone Estate. 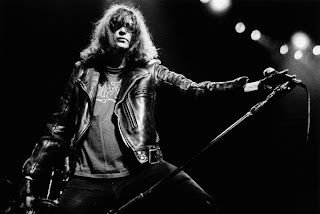 Ramone, whose real name was Jeffrey Hyman, died in 2001. The posthumous solo album . . . Ya Know? came out last year.